Much like Louis and Lestat slake their thirst on their human herd, Matthew and Dean bite deep into this delectable tale of gothic horror from the one and only Anne Rice. Vampires offer plenty to talk about, and plenty to theorize over: Why people are so fascinated by these beautiful corpses? 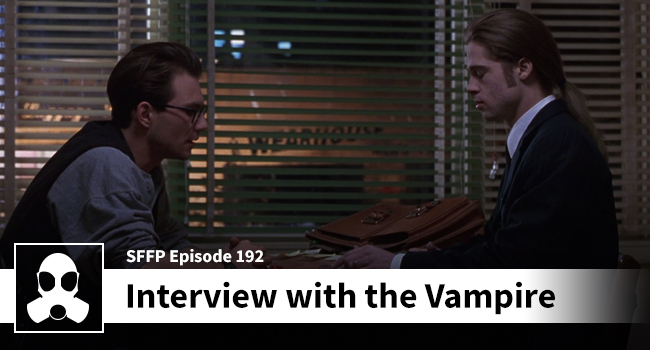 Matthew calls “Interview” the gold standard of vampire fiction (film). Dean called it a collection of scenes that may be greater than the sum of its parts. One thing is for sure – there is plenty to talk about especially with this being LSG Media’s first vampire flick covered in almost 200 episodes. What were we waiting for? What are you waiting for? Push play and let the words course through your ears. Great show as usual, guys. I always enjoy Dean’s reminisces about when he first saw a movie and where he was in life-probably because we’re the same age and both were the type of young men inclined to wear a Highlander hair tie. One of my favorite parts of Interview With The Vampire (both film and novel) is that it’s almost a sitcom about two vampire roommates who have spent way too much time together. The interactions between Lestat and Louis are fantastic. From the scene in Louis’s dining room that opens with Lestat casually throwing grapes at him to the intensity of the scene where Louis refuses to kill the prostitute, the tension between these two drives much of the film for me and I miss Lestat once he’s out. I had read a few of the books when I heard Cruise was cast and I didn’t experience the fanboy rage that is so common today. I was just curious how it would turn out. I could not imagine him in the role and expected a good surprise. In hindsight, he seems kind of obvious. Cruise is good at playing a passionate, complex man who commands your attention and that is a lot of who Lestat is. I think the flack Pitt gets from some quarters is more about the role than his acting. He gave a great performance; Louis is just a downer character. Dean summed it up nicely when recounting the scene where Claudia says Lestat deserved to die and then Louis had to answer with “Well maybe we deserve to die, too.” Pitt did a damn good job. The direction is fantastic, the movie looks gorgeous, and Banderas crushes it as usual. A great film to watch and a reminder of a time when long hair was a male beauty requirement along with the occasional celtic hair tie. Keep up the good work, guys. Ha! Thank you so much for the comment. This is great. I love your insight here. All hail the Highlander hair tie.